Even if you think hitting on women in a confined space is sketchy, or intrusive, or just poor form, the fact remains that airports (and airplanes) are packed full of hot singles and potential partners, some of whom may actually want to meet you. And, as meeting them has as much to do with timing and opportunity as it does with your ability to not talk about World of Warcraft right off the bat (or ever), here are three airlines that -- whether wittingly or not -- actually help your cause. While there are many reasons to avoid flying Spirit Airlines (namely, having to pay for the privilege of carrying on your bag), their horrible on-time performance actually plays into your hands in this situation. Not only do flight delays provide you more time in the airport to work your mojo, but they offer a natural, non-threatening conversation starter and common, frustrating experience over which to bond. 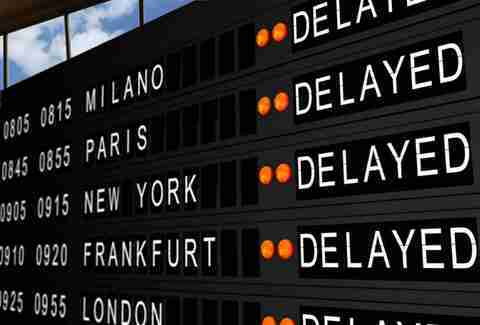 You don't have to be a Don Juan -- or worse, Joseph Gordon Levitt in Don Jon -- to say, "I missed the announcement, any updates on when our flight might actually take off?". See, not creepy at all. And longer delays allow for the possibility of a drink at the bar by the gate. Which might be creepy. And if you can't face the thought of a Spirit flight even for the sake of picking up, try American Airlines -- on-time only 82% of the time last month. Initially panned by prudish passengers apparently uninterested in receiving free booze (or snack packs! 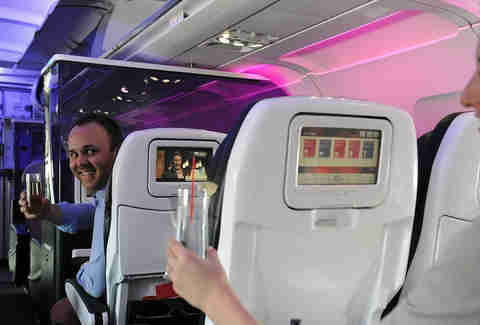 ), Virgin America's seat-to-seat delivery service allows you to send drinks, food, and texts (suggestive or otherwise) to potentially receptive fliers. Which's perfect if you're better at writing awkward "So, do you fly often?" texts than making uncomfortable small talk about the straightness of her teeth. Will the blond in 12D find your anonymous advances flattering? What about her boyfriend sitting in 18A (what, they got split up!?!?)? Who knows. But at least that sly dog Richard Branson wanted you to have one last shot before unsuccessfully stalking her at baggage claim. 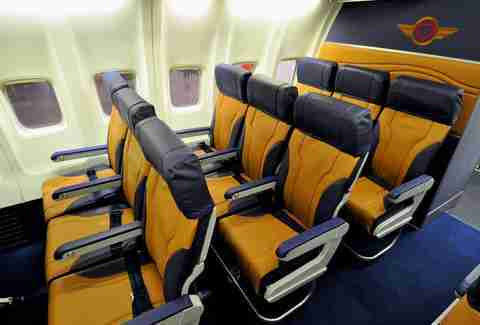 Like splitting aces & eights, or starting Case Keenum against Jacksonville in Fantasy, Southwest's pick-your-own seat is all about increasing your odds. No, you can't make her talk to you, or laugh at your "hilarious" riff about Carrot Top as a Starbucks barista, or even put down her iPad to acknowledge your existence, but you can at least ensure she spends the duration of the flight uncomfortably fidgeting in the seat next to you. Which buys you two hours to come up with something better than Carrot Top at Starbucks (…so, you're saying there's a chance!). Incidentally, Southwest finished third worst in on-time performance, providing a rare perfect storm for picking up: easy conversation at the gate followed seamlessly by sitting in the same row. You can't argue SW's not looking out for you.